Have you seen this type of fruit before? Well, this is an exotic fruit called Cempedak. It’s popular in Southeast Asia, particularly in Malaysia. The size of the Cempedak fruit is much smaller than the more well known Jackfruit. The texture of the Cempedak flesh is soft, sweet, and has a strong aroma. They can be eaten fresh; but, they tastes much better in fritters. 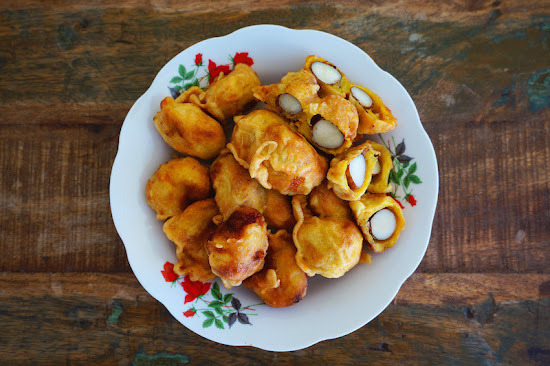 Deep-fried Cempedak Fritters are commonly sold in the streets of Malaysia. Combine all the ingredients for batter and mix well. Pour enough oil into a saucepan or in a deep fryer on medium to high heat. Coat the Cempedak flesh with batter and fry until golden brown in color, about 8 to 10 minutes. Remove the Cempedak fritters with a slotted spoon and drain on papers and serve warm or at room temperature. not only have I not seen it, I've neevr even hear of it!! Looks interesting! That looks interesting, similar to a durian. I've never tried either fruit before. Great recipe! I've had something very similar with durian and it was delicious. Looking forward to using cempedak with your recipe in my own kitchen. Thanks!